Migrating WordPress website to a new hosting provider is not a difficult task and only takes 20-30 minutes if your database is not big. I have recently migrated one of my WordPress website from godaddy.com to arvixe.com keeping the domain name same and so writing this post. If your website has a significant traffic that continuously updates your database then you should place your site in off line mode to make a consistent database backup. Log in to your wp-admin section of WordPress and install the required plugin. There are some plugins: i) http://wordpress.org/plugins/maintenance/ ii) http://wordpress.org/plugins/wp-maintenance-mode/ by which you can place your website in offline mode. But site with less traffic or for new WordPress site you can ignore this step. If your Permalink is set other than default , set it to default. In My case it was Post Name. Log in to your wp-admin area. Go to Settings -> Permalinks and set permalinks to default. It is recommended to deactivate to all of your plugins. But I think only deactivation of caching plugins like “WP Super Cache” and “W3 Total Cache” is enough. Go to Plugins and deactivate plugins. Don’t deactivate Maintenance Plugin if you have installed any to place the site in Maintenance mode. Go to PhpMyAdmin through your cPanel. Select your database to be backed up. Check all tables and select export. Create a wp-files folder on your desktop and download all WordPress files from your existing hosting directory. Now, go to your new hosting PhpMyAdmin. Select the newly created Database and import the backup Database file to it. If your backup Database file is big , zip it and then import. Connect Filezilla to your new hosting FTP account and upload all of your WordPress files to public_html or your domain location. At this point, you have done the work to migrate your website to new Hosting. The last step before taking the website live on new servers is to test your website. To do this, you will need to modify your hosts file on your computer. You will see an IP of your old hosting webserver is returned. My website www.techinfobest.com was located on GoDaddy.com and my webserver IP was 192.186.219.135. If you were running Windows XP or lower, you won’t need to run it as administrator as this functionality only exists in Vista and above. Locate Notepad within your Start menu. If it is not already there, you can type “notepad” into the search box to show it. Then, right-click on it and click on “Run as administrator”. Navigate to Windows Defender hover over the right corner to bring up the navigation bar. Click on the icon that appears to be a magnifying glass to start a search. Type in “Windows Defender”, click on the icon that appears. It will be labelled “Windows Defender.” Click on this icon and the application will launch. When Windows Defender opens, click on the tab labelled Settings. Click on the Add button and you’ll see it added to the list beneath the file locations. Click on Save Changes in the bottom right and then close Windows Defender. The next step will be actually edit the file. As per the instructions above, you will need to edit the file as an Administrator. Hover over the right side again, and then search for “Notepad”. Open it as an administrator. Open the file as per your HOSTS file path. Make your edits, and click on SAVE by clicking on “File” to bring up the menu. This completes the HOSTS file edit in Windows 8. Now, you need to add your new hosting webserver IP address at the bottom of the file. In general, you will find your new webserver IP addresses on the left side of your new cPannel under name of Shared IP Address or Dedicated IP Address. 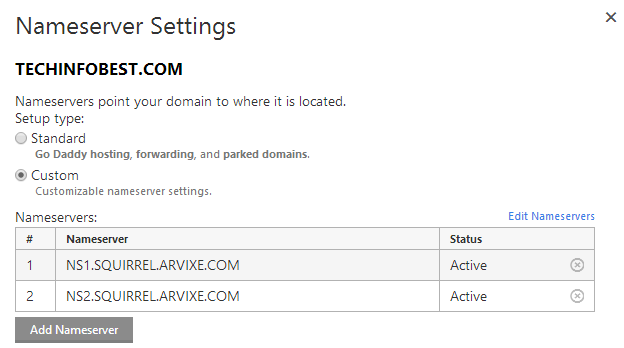 I shifted to arvixe and found the IP address on the left named Dedicated IP Address. Clear your Browser cache then close and open it again. Browse the website. In my case, I browsed www.techinfobest.com. At this stage only you are browsing your website hosted on your new hosting location where as all others are still browsing your website hosted on old hosting provider. ** If you browse from Linux or Unix based operating system , the above procedure is very easy. Just add entry in /etc/hosts file. Then your server will not go for DNS query rather use /etc/hosts file entry. Click on the Go button to run the code and change the URLs for all images and posts of wp-posts table. If everything seems ok, you can delete or comment your newly added entries to hosts file. It may take some hours to update your new hosting location to all nameservers of the world. The above procedure may seem little lengthy but this is the safest way of “Migrating WordPress website to a new hosting provider”. All the stages may be not required like “Place website in Maintenance mode”. Even you can ignore hostfile modification tricks if you confident that don’t need to test on the new server . However, you have to follow steps like Plugin reactivation, Back the Permalinks settings, Domain Name replace( if required). Migrating WordPress website from your local machine to new hosting provider is also almost same procedure. higher! Come on over and consult with my web site . Prettty great post. I simply stumbled upon your weblog and wahted to say that I’ve truuly enjoed browsing your blog posts. My weblog ???? injustice ?? ??????? Fro making personal blog is not a difficult things. WordPress makes it easy and flexible. go to wordpress.org and download it and start your blogging. But you need separate domain and hosting. You can also create free blogging without hosting cost in http://blogspot.com/ but you can’t use own domain. Nice weblog right here! Also your web site rather a lot up very fast! in this kind of house . Exploring in Yahoo I finally stumbled upon this web site. Reading this info So i am happy to exhibit that I’ve a very excellent uncanny feeling I found out just what I needed. nutshell, a business that’s designed to run on the internet via a website.